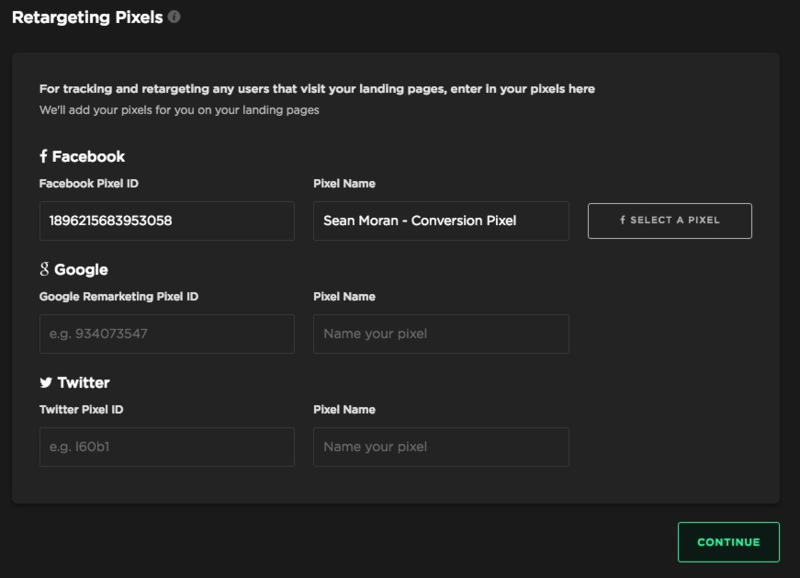 Powerful smart links to help you understand who your customers are and track conversions. 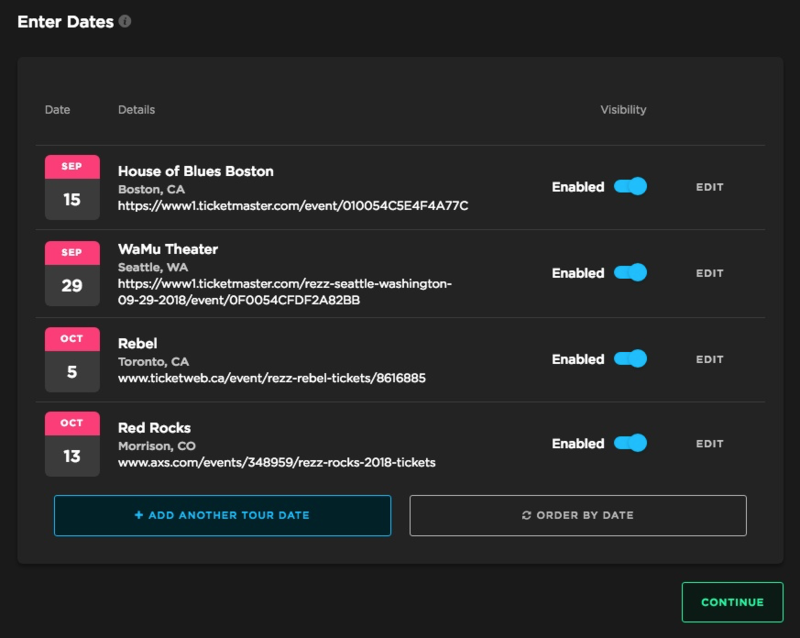 It's easy to create a FanLink to direct your fans to their preferred event. Click "+ Create a FanLink" to start creating your link. This article will take you through the process step-by-step. 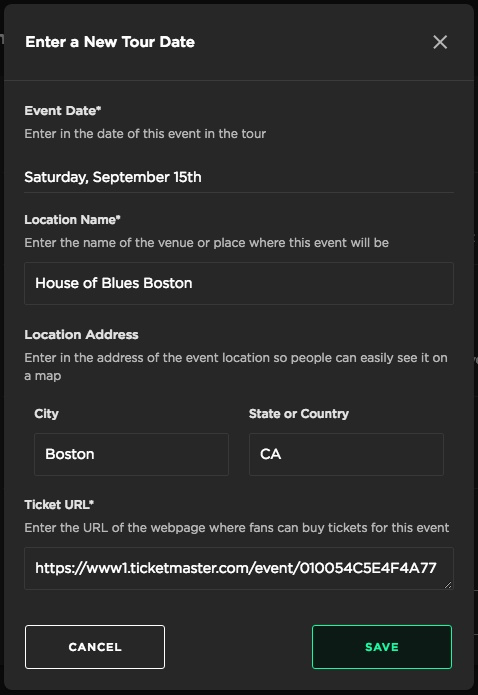 2) Select "Add a Tour Date"
Select the date of the event. Then, enter the name of the venue and its city and state. Copy and paste the URL to the ticketing page for that event. Then, click save. Select "Add Another Tour Date" to enter other tour dates. Repeat this process until all of your tour dates appear. Then, select continue. 4) Customize your landing page. 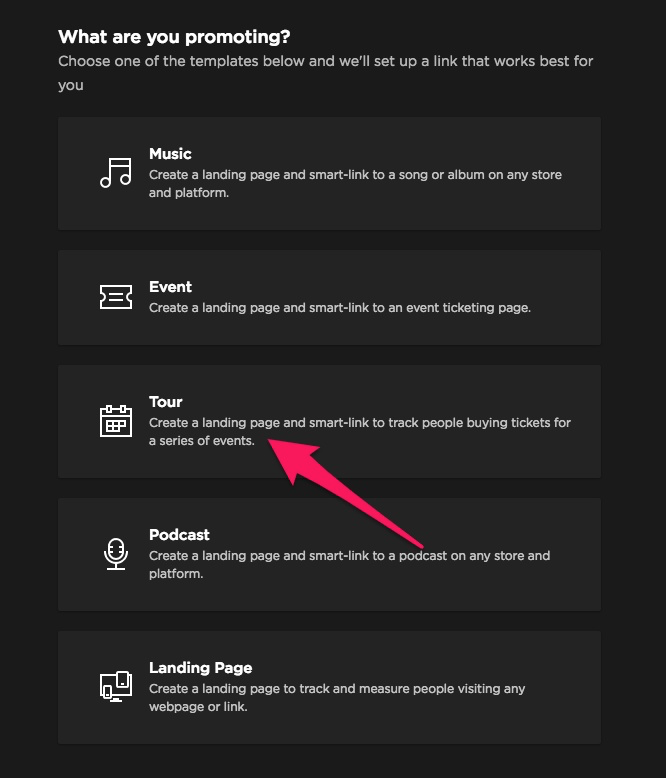 Use the inputs and preview to customize your tour landing page. Enter your artist’s name, the name of the tour, and any other details you want to include. Upload a landing page image and change the background if you would like. 5) Customize your social sharing. Design the look and feel of your social posts by customizing your metadata. 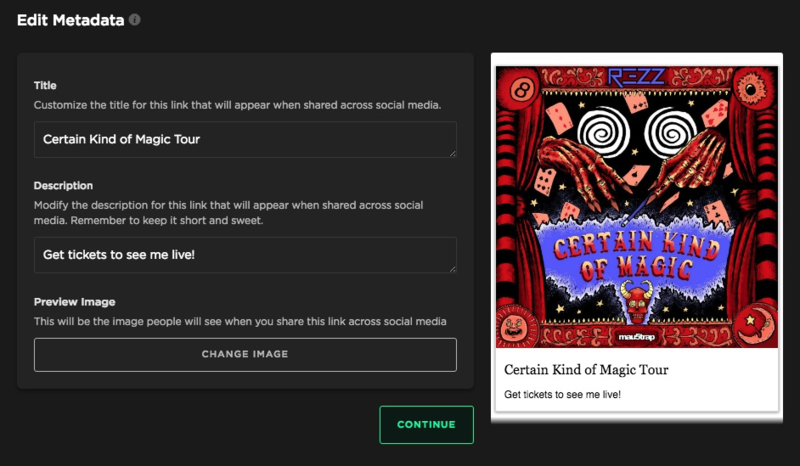 Use the preview to see how your Tour Fanlink will look when you share it on sites like Facebook. 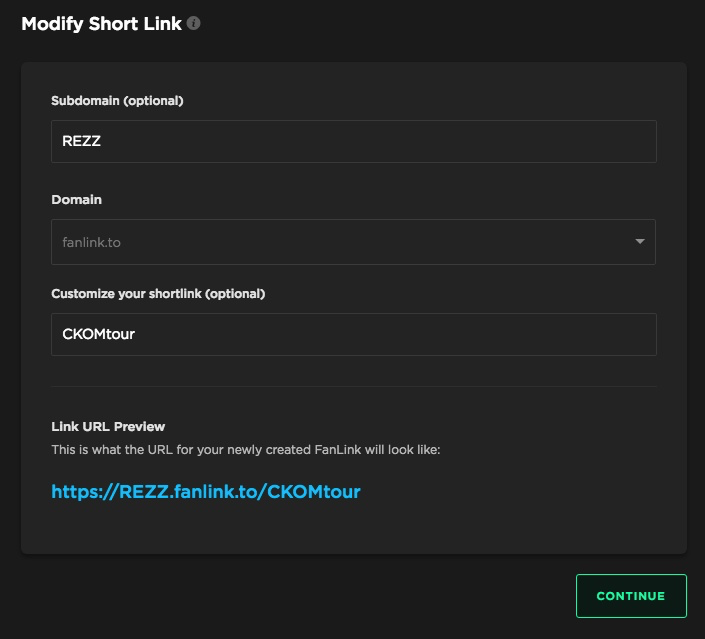 6) Edit your URL link. 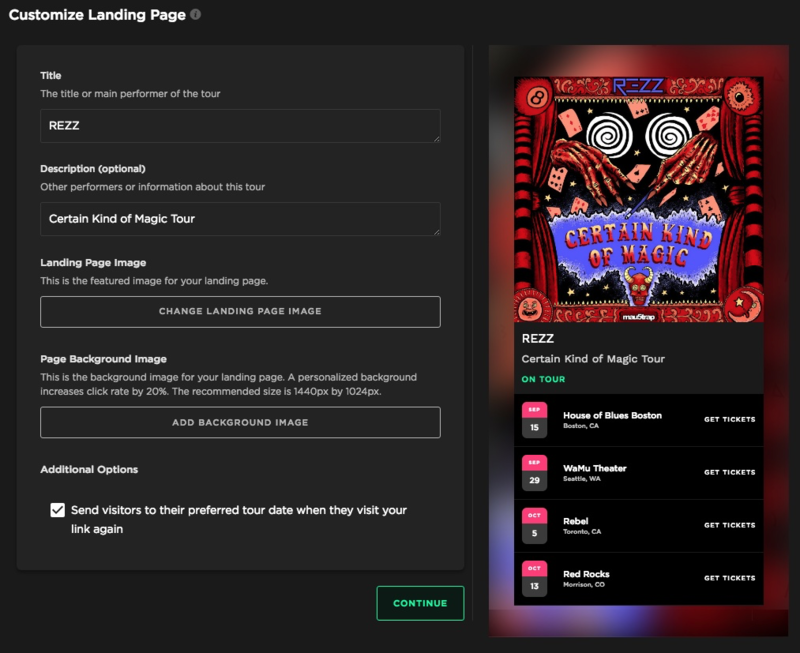 Your tour landing page will have its own URL. Customize the link so you and others know it is for your tour. By adding your Facebook Pixel ID to your Tour Fanlink, you can track the fans that visit your Tour Fanlink. Click the 'Select a pixel' button to choose your pixel. Don't have a pixel yet? Create one here. Name your Tour Fanlink so you reference it late. Only you and your team will see the name of the Fanlink inside ToneDen. Also, if you’d like to organize your FanLinks, you can create tags for them (e.g. “Tour Name"). 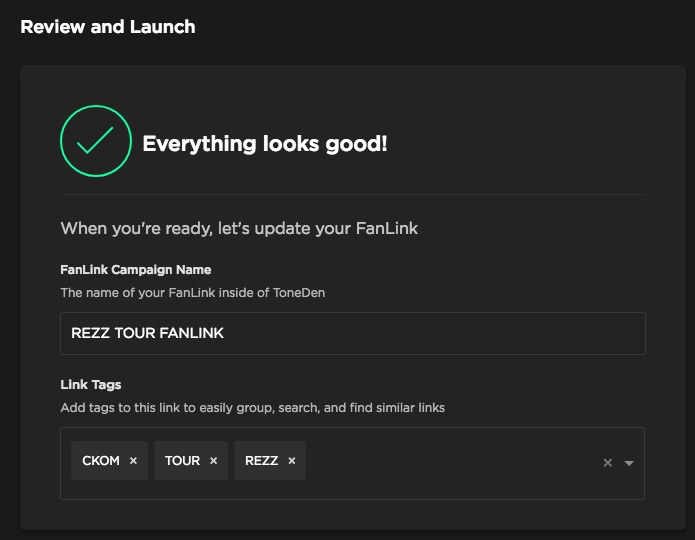 After you've double-checked everything, press "Create FanLink" and you're good to go! 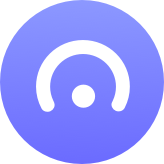 Share your Fanlink by copying and pasting its URL or create a Playbook for it. You can edit your Fanlink anytime by selecting the "Edit Link" button.